Well I never thought even 10 yrs ago we’d own a saw mill, but here we stand today, owners of one. I spent the better part of 6 months reading and sending questions to different sawmill companies. I look at companies in Canada and the USA. I am a big proponent of buying as local as possible. So the focus was on Canadian companies. It started out with three choices in Canada; Woodland Mills, Norwood Sawmills and Wood-Mizer. All in Ontario. The least expensive sawmill was from Woodland Mills in Ontario, and they had a new dealer about 1 hr east of me. Upon inquiry to see if the mills were manufactured in Canada I learned that the mills were made overseas. They seem to have happy customers and that’s good to hear, but I choose not to buy that one. The next two companies, Norwood and Wood-Mizer and more well known in sawyer circles. Both companies claim to build their mills from parts sourced in Canada and the USA. Both are much more expensive than Woodland, and neither are true Canadian companies. Wood-Mizer is in Europe, Norwood head office is in the USA. So it made me pause and give a lot more consideration to the purchase. I looked at Wood-Mizer because they had a dealer an hour west of me. But based on the email I received from them, I won’t be buying from them. So that left Norwood. I actually committed to a purchase, only to learn that delivery would be 6-8 weeks away … yet they charged my credit card. I was concerned over that. I canceled the order. Norwood did come back to say that they would change their policy to a $1,000 deposit-only being required rather than an up front payment for mills that out of stock and waiting to be built. In between those few days conversing with Norwood I looked at TimberKing, which is a an American company down south. A sturdy, 4 post construction with solid steel base. I spoke with the owner about getting a mill up my way. But unfortunately the freight was simply too expensive. Their mills don’t break down for shipping onto pallets. So a tractor trailer would only fit 2 mills. Then I discovered a fifth manufacturer, SMG Champion out of Quebec. And they had a dealer rep right here in Nova Scotia. Mike Warner over in Barton, Nova Scotia (just outside near Digby), about 6 hr drive west of our location. SMG Champion is a wholly owned Canadian company and manufacturer. They do everything here. Nice, that’s what I was looking for. Now to look at what they offer. They offer a number of different size mills. Most if not all are designed to take a maximum of 36 inch diameter logs. I’ll probably never see logs like that, would be nice though! What I did like about it was the solid steel, one piece carriage. As well as the overall simplicity of the design. Trailer package was optional. A couple days back and forth talking with Mike Warner and I again learned the company was backed up in in production. 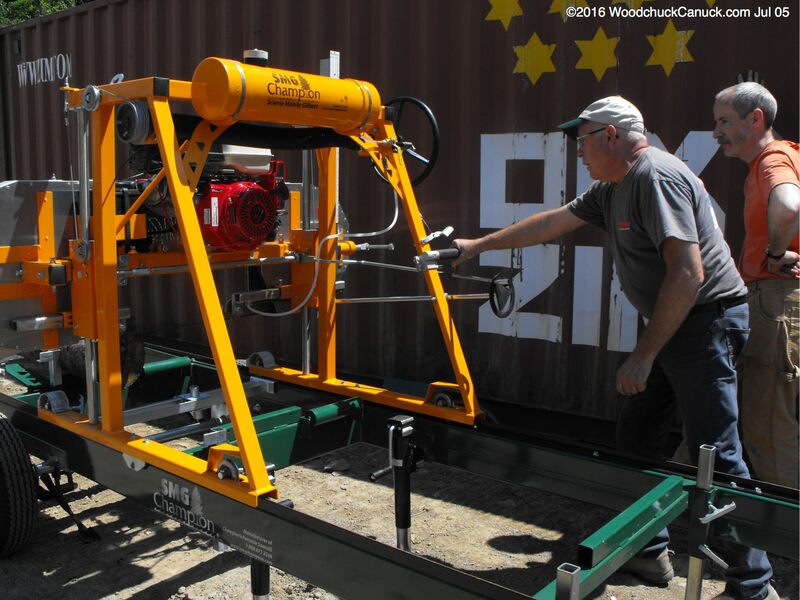 It seems that portable small sawmills are becoming popular. Mike did have one in stock that was not quite what I was looking for, but, I was not that set on something particular anyway. I accepted his offer and the deal was made. He would personally deliver it in a couple days. His road trip to our location was not without its own problems. No thanks to Nova Scotia Dept of Transportation, a poorly constructed transition from rough surface asphalt to smooth asphalt offered a 2 inch height variance that was not signalled as a road hazard. The result, the sawmill axle hit hard and broke off one of the leaf spring brackets and ruined a tire. Luckily no one was injured in that accident. Mike was fortunate enough to come across a local welder who promptly fixed Mike’s broken bracket and he was on his way again. You gotta love Maritime hospitality. Mike made it to our location and proceeded to install and instruct on the safe operation of the mill and cutting of a log. The carriage is so balanced and precise, a breeze of wind will easily move the carriage (orange part of the mill) down the frame. He was friendly and offered great advice and tips. He brought everything necessary to get sawing. Fuel, water, soap, windshield washer fluid (for those frosty days), work gloves, cant hook, booklet, blades. Everything. That level of service is a rare thing these days. I’m only just getting started with milling so I honestly have not yet formed an opinion on the mill itself, but I like what I see. Here’s a video of that delivery day.